There's really only one reason for the existence of a work like La Straniera. 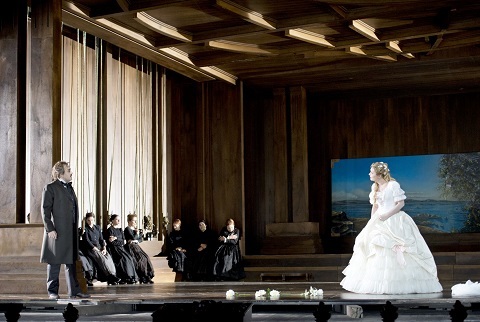 Like most bel canto operas, it's a highly charged drama of limited plot credibility but it gives the lead soprano ample opportunity to demonstrate her singing abilities. There are occasionally other qualities to be found, and with Bellini the music is usually filled with glorious melodies that are a little more attuned to the dramatic content, which is fortunate since the plot of La Straniera needs all the assistance it can get. 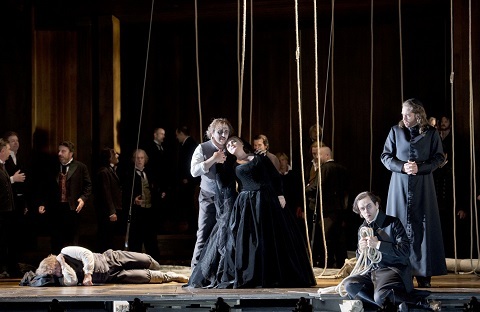 Fortunately, the production for the 2013 summer festival at the Zurich Opera House had one of the best teams imaginable to get the best out of the work with Fabio Luisi conducting, Christof Loy directing and Edita Gruberova singing the lead role of the mysterious stranger. In terms of plot, well if you're a member of the chorus playing the townspeople, you're thinking would go along something like this. Who is that mysterious stranger seen moping around town, dressed in black? We've always known she's up to no good and now we have something on her. She's been seen as a threat to the forthcoming marriage of Arturo to Isoletta, and now she's only gone and actually killed Baron Valdeburgo. Let's put her to death! Oh, hold on - here's Arturo and he's claiming it was he who killed the baron. And now here's the baron and he says he's not dead after all. Well, she must still be guilty of something since she's keeping her identity secret. Can we still not just put her to death? Oh wait, she's the Queen! What!? It takes a lot to make that kind of plot work. It goes without saying that you need a soprano of extraordinary ability to sing the role of Alaide, but you also need a strong singer who can also act and have sufficient personality of her own to lend to the role, and you need a director who can actually give them something to work with. You have all the necessary qualities in Edita Gruberova and Christof Loy. Having worked together in recent years on Donizetti's Roberto Devereux and Lucrezia Borgia to spectacular results, the prospect of them working together on Bellini's opera was to say the least mouthwatering, but not without a certain amount of trepidation as to whether they could pull it off again. Thankfully, after a few initial doubts, they did. Loy's concept wasn't the clearest, but at least it wasn't one of the minimalist chairs and dinner jackets productions that he's been fond of recently. He could do that and make it work I suspect, but instead he aims for a fairly traditional period setting, with real costumes and backdrops and everything. There are a few quirks inevitably, most of them involving ropes. Is it because there's such a mournful pall of death hanging over the start of the opera? Isoletta concerned about the likelihood of her marriage tomorrow turning into a fiasco because of Arturo's love for 'la straniera'. Is Arturo's impossible situation likely to lead to him hanging himself? Or are the ropes representative of the townspeople, who are just puppets of the suspicious Osburgo? Or does it reflect their mood and their desire to string up the dark evil woman in their midst? Whatever the purpose of the ropes, Loy nonetheless sets the mood well, contrasting the black mourning clothes and mysterious veil of the stranger with the wedding dress that Isoletta wears in preparation for her wedding. La Straniera's dramatic content turns on the question of whether we going to have a wedding or a wake, and that's well covered. Or a coronation. Bellini nearly gives the game away early on, Auturo having a vision of the mysterious woman wearing a crown and Loy has a little bit of fun by having Gruberova as Alaide walk on stage in the second act wearing her crown before realising that everyone is actually waiting for the bride and slipping off-stage again. Setting the appropriate mood is one thing, but dramatic conviction is all important and Loy makes that work too. There's no standing around here. Every ounce of emotional charge to be found in the situation, in the score and in the singing is made to count. It's the singing which is paramount however and as in those previous cases of Loy working with Gruberova in the bel canto repertoire, every note and gesture is put in service of making what is a ludicrous plot actually feel like a matter of vast life-or-death importance. There were a few early concerns over how long Edita Gruberova can continue to carry roles like this, but they too were soon completely banished. There were a few slight wobbles early on and her pitch wasn't quite there in her duet with Dario Schmunck, but when it came to delivering the coloratura in those frequent scenes of great emotional anguish, Gruberova was beyond reproach. I've heard the great Slovak soprano many times but never before live in the theatre, and her voice is simply remarkable. Without microphones and mixing involved, her voice just dominates everything with that distinct timbre that is clear and resonant. She not only carried the singing honours however, but - particularly in the hands of Christof Loy - her acting ability was just as impressive. From the moment she walks on the stage, she is carrying the weight of her character's background and status - regal and mournful - and expressing it in gesture and in every nuance of her vocal coloratura. La Straniera may to all intents and purposes be a one woman show, but the supporting elements built around the lead all need to be in place as well and the supporting cast were all very fine. 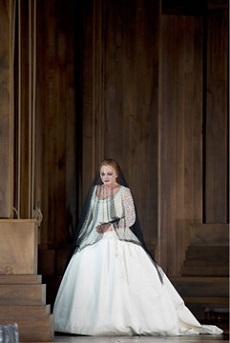 Isoletta only appears at the beginning and the end of the work, but mezzo-soprano Veronica Simeoni ensured that her character's predicament contributed to the setting and made a strong impression. Dario Schmunck was a rather dishevelled-looking Arturo, but supplied all the fire that is necessary to charge the drama. Franco Vassallo's Valdeburgo was well received and rock solid, even if his diction wasn't always the clearest. Even with such reliable support, with Loy's strong dramatic focus and Fabio Luisi working it from the orchestra pit, it's still a challenge for anyone to make the ending of La Straniera work. An air of disbelief at the plot twists inevitably remains here, but just as much admiration for the attempt to carry it off. If Edita Gruberova can't quite do it then no-one can.